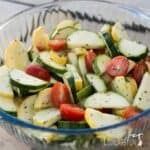 It’s the middle of July and I was looking for a quick and easy summer salad to enjoy. So, I picked up a bag of pre-shredded cabbage during my last grocery store trip. To save time, I used the bagged cabbage that already shredded. You can always pick up a head of cabbage and do that yourself. I like the pre-shredded kind for making a simple Thai chicken salad too. 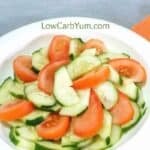 I prefer making this quick and easy low carb coleslaw recipe without carrots. As most of us know, carrots contain quite a bit of natural sugar. Leaving them out lowers the carb count. 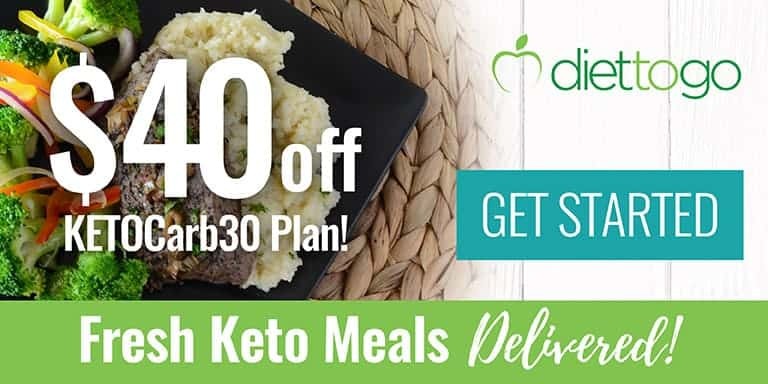 To save even more carbs, I used a stevia product that has zero carbs. Unfortunately, most coleslaw dressings add sugar. To keep carbs at a minimum, it’s always best to make your own dressing at home. That way you know there’s no unnecessary added sugar. Most of the carbs in this coleslaw are from the cabbage. However, these are the healthier variety since a lot is from fiber. 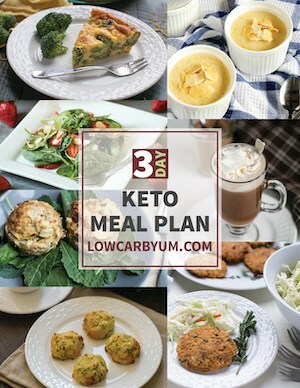 Be sure to use a zero carb mayonnaise without any added sugar. My favorite is avocado oil based mayo. And it’s super easy to make your own mayo at home. For homemade mayonnaise, you can see my coconut oil mayonnaise. Coconut oil does make the mayo a little hard from the refrigerator so if that bothers you, use another oil like avocado or olive. 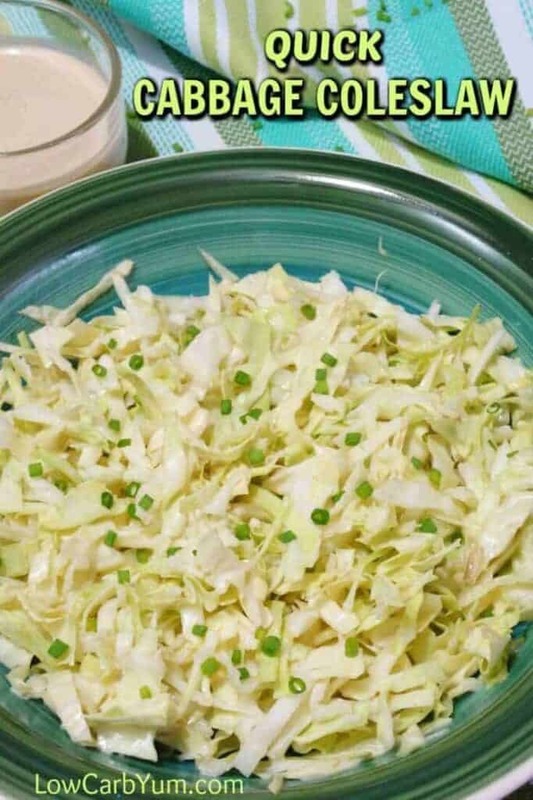 I like to make a big batch of this low carb coleslaw salad on the weekend. That way, I can eat it throughout the week. 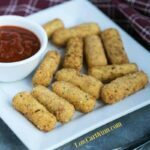 It’s a great little side item with lunch or dinner. And, it’s easy to toss into the lunch bag for work. I could eat it just about every week in the summer. 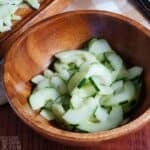 Coleslaw is also a perfect low carb salad to take along for an outdoor party or picnic. It goes great with hamburgers and hot dogs (without the bun, of course). If you like the more traditional coleslaw, you can certainly add in a few grated carrots. 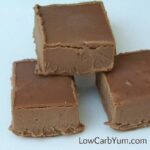 It won’t add too many carbs as long as you use them sparingly. 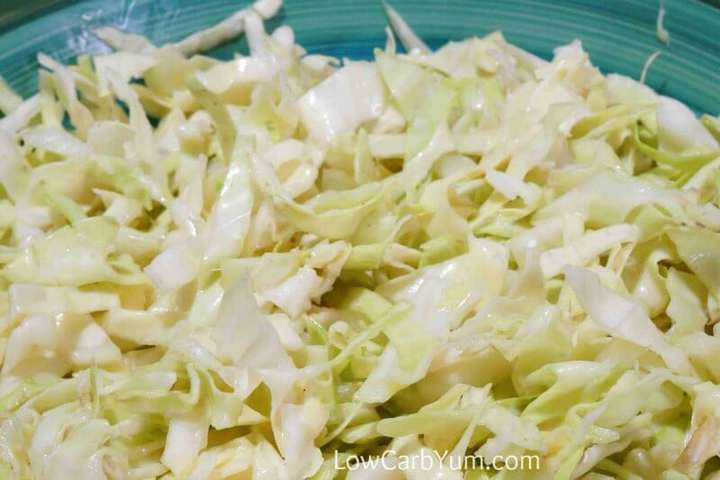 A lot of people forget about cabbage as a delicious low carb vegetable. It seems that cauliflower always gets the attention. 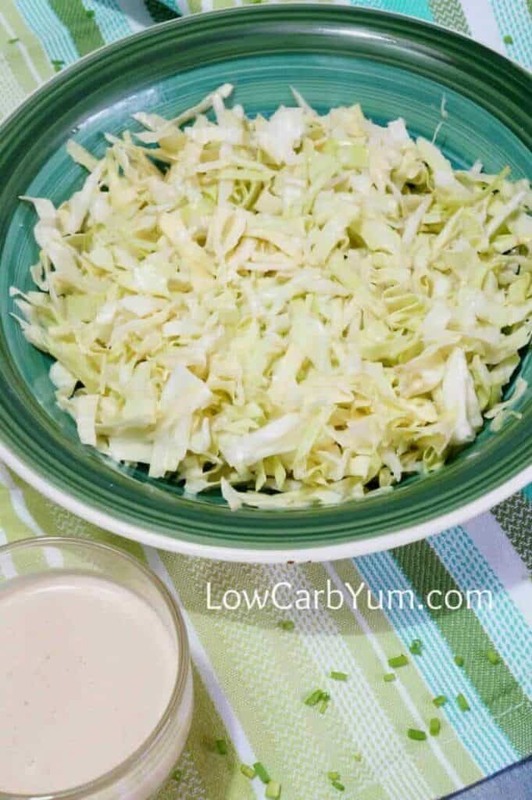 Cabbage is good for more than just a low carb coleslaw recipe. It can even be used as a wrap for sandwiches. Not sure what else to do with cabbage? 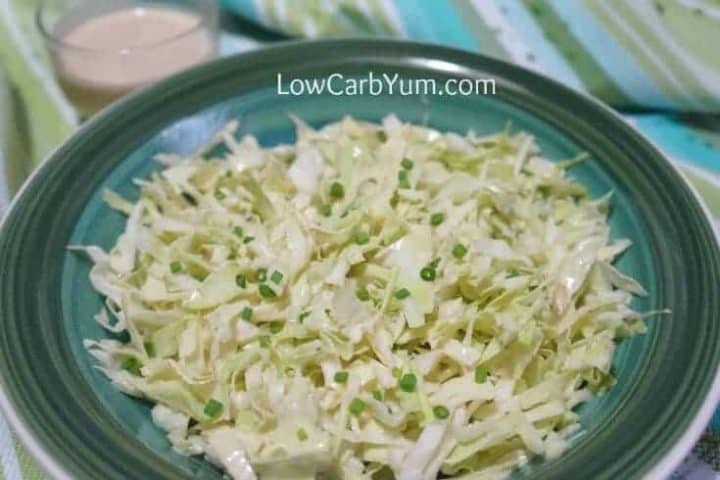 You can check out this collection of low carb cabbage recipes at All Natural Ideas. 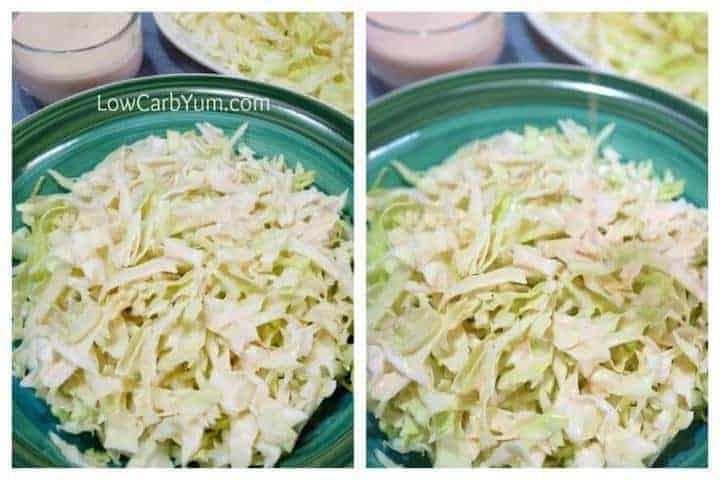 I really enjoy making crack slaw as well with cabbage. It’s basically just shredded cabbage fried with bacon and hamburger. Another great thing to do with cabbage is to grill it like steaks. You can find my grilled cabbage steaks recipe here. So, as you can see, there’s a lot more you can do with cabbage. 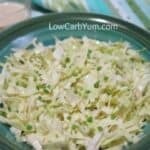 You don’t have to limit yourself to a low carb coleslaw when buying a bag of pre-shredded cabbage. Although cauliflower seems like the top low carb vegetable due to it’s versatility, don’t forget cabbage. 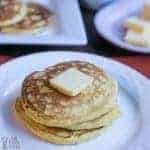 I’ve seen many people use it like noodles in cabbage lasagna and in skillet dishes. And, it’s a stable ingredient in egg roll bowl recipes. What’s your favorite way to eat cabbage? This coleslaw omits carrots to keep the carbs at a minimum. 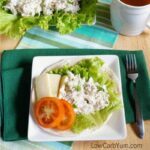 The creamy low carb dressing is sweetened with stevia. Mix cider vinegar with stevia (or other low carb sweetener) packets. 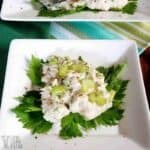 Whisk in mayonnaise and celery seed until smooth dressing forms. 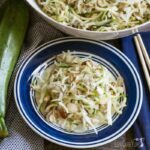 Pour dressing over shredded cabbage. 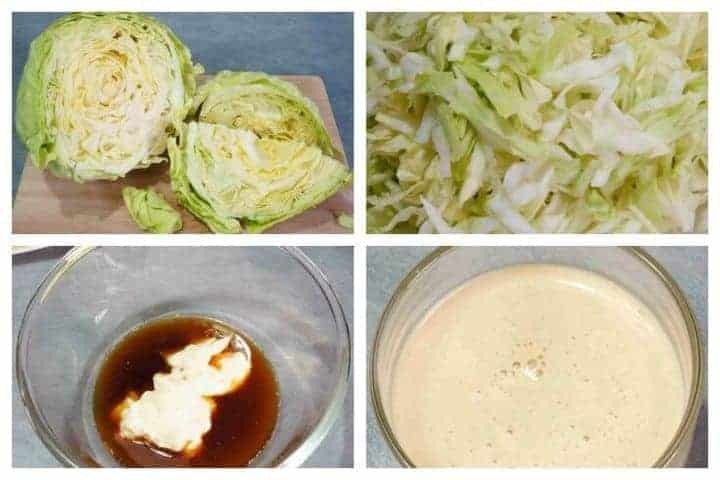 Toss to coat cabbage with dressing.